Here’s some important information to share! Our Customer Service Billing Help Office has a new home. 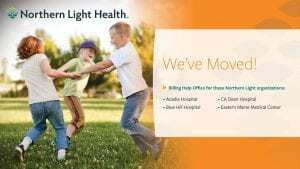 The team is now located in suite 140 at the Northern Light Health Center at 895 Union Street in Bangor. And if you have any questions, you can always call the hospital’s main line at 973.7000.